If “street-style” blogs are useful right now, in this difficult economic time, then it is because they highlight simple little styling tricks that can inspire us to see the wardrobe we already own in a new way. You know, I own all of these pieces (the camel coat, the denim jacket, gray scarf, dark wool trousers, shiny black oxfords) but I would have never thought of combining them this way. His coat fits just right to accomodate everything he has on underneath, without looking too bulky. Adversity is the wonderful mother of invention in this case. , Fab backdrop, you caught this guy at the right moment. Great shot, by they way Sart. that’s so true, which is part of the reason I subscribe to so many “street-style” blogs. I’m not sure that I could pull this off with these colors, but I’m going to try it with some others. I agree with you, Sart, this gentleman looks great in his unusual combination. For me it’s the colours: the pale blue and grey against the dun coloured covert coat. Also his coat is beautifully cut and fits him perfectly. It’s hard to go wrong with good tailoring. I think if you have a well tailored coat, dress or jacket as your style ‘safety-net’ you can get away with adding and mixing all sorts of unlikely elements. A wardrobe is the thing you hang your clothes in. Clothes are the things we dress in. Isn’t this easy? Love this look, and the narrow cut and length of his trousers. Love the coat. I wish he had relaxed a little so it didn’t gape open. Man, oh man, oh man…. I am so in love! I really think this entire look couldve been very dull if it wasnt for the amazing fit. Its pretty basic colours, and despite what was said, Ive seen these items thrown together before. But because everything is so precisly tailored and sharp, it looks amazing rather than heaped upon one another. Plus, I love the fact hes standing on the white, its just highlights the lower body so much, which is great because the upper part could have overshadowed it easily. I love the rough light blue collar of his denim jacket against the fitted beige coat. Beautiful. I love everything here- the palette, the fit, the individual pieces. It all suits him perfectly. The beautiful light in the photo doesn’t hurt, either. you know there are some people give you crap because you only photograph people that can afford all these straight from the runway looks. But I think they are being pretty narrow minded that they can’t look beyond the labels and see inspiration in the color palettes, silhouettes, proportions, or the combination of different pieces. This is an excellent picture. I really like the color of his coat (and how tailored it is to him), against the greys he’s wearing. I feel like I’ve been seeing lt. denim jackets pop up in more tailored looks. He wears it well. Love the look and the soft colors..and he’s not too hard on the eyes either! This man’s attire and combination is really inspiring…a perfect-fit overcoat on a demin (jacket)? This is something nobody’ll think of doing- combining classic with streetstyle. He’s someone who knows what he’s doing. Thanks sartorialist. What a great, classic look. I LOVE this. That’s why we subscribe your fabulous blog. Thanks S.
I’ve read about this blog in a brazilian magazine, “VEJA”. I like fashion, although I’m not fashion and don’t even study that. And I like even more photography. Amazing. I don’t think another word can better describe this. The “sea” colored scarf is what turns me on about this outfit. You know, you’re right. I have never made a Sartorialist inspired purchase. I am, however, constantly motivated to work with what I have. The Sartorialist is liberating in that way. I absolutely agree with you about the usefulness of a street style blog.Truly I don’t think the mix is so original: we have just seen it a lot.. do you want an example? Kanye West..! Acually I think it’s becoming a bit boring..
i couldn’t agree more. today i paired a denim blazer over a cotton dress, both items i haven’t worn in a long time, but with a new (ish) pair of boots, its look completely new and fresh. That’s the main reason I come here. Looking for new ways to wear what I already own. Hell, I have a LOT of clothes and now I’m broke as a 10 year old Hundai. I haven’t even stepped foot in a outlet mall in months so you know the bank account is seriously ill (ill in the way it used to mean – sick – ugh, sick in the way it used to mean – you get it). Over the years you’ve given me more useful inspiration than I’ve gotten my entire life from the various “fashion” mags. I think they’re geared toward women with REAL money and wannabe Carrie Bradshaws. I’m neither. This wearing of the denim jacket beneath a heavier, roomier coat is a perfect example that we’ve seen a few times here – and I’m rockin’ the hell out of – thank you very much. It adds a touch of casualness to anything that might otherwise look a bit stiff or conservative. I think this is a great example of the benefits of simple clothing. On its own, no individual piece of this outfit is particularly daring or original, but the way they’re put together really makes them interesting. The more “basic” items you own, the easier it is to mix and match them to create new looks…and this guy clearly knows how to do it! BTW – those shots you and Garance did for Glamour. WOW! I really loved the one with the jean vest and pants. Simple. Lovely. Cool. Not girly…. uh, shall we say very Garancey. I’ll actually buy the magazine now. ie, the gorgeous man in the photograph has a fantastic wardrobe. :-D I had to laugh out loud because that’s so true!!! Thanks so much for bringing us so many inspiring looks! yeah, awesome. i did this last week in chicago. had my RL engineer’s denim jacket and paired it with my black wool overcoat. I would never have thought of this!Really great and inspiring shot! Same with the women below. The french women have taught me that I can wear shorter sleeve jackets even in cold Minneapolis! you have been capturing the layered denim look quite a bit lately and i have totally caught the fever of it. my little denim jacket has a second life now. loving this look. This looks great. He looks so sophisticated, yet still stylish and relaxed. You are so right, Sart. Your point also underlines the importance of buying a smaller number of good quality pieces for your wardrobe, rather than lots of lower quality stuff, as good quality clothes can be combined and recombined over and over again and look good in a variety of situations and with in a variety of styles. Also, better quality clothes last, so will always be available to use. I absolutely agree with you! “Street-style” blogs inspire to look in my closet and go”oh! I have that. Why didn’t I think of it before?” A recent pair of not-worn-lately pumpkin colored pants and a corduroy jacket from my closet came together to totally surprise me recently creating a great bohemian statement! What a dashing Parisian! He is my type of man! So handsome! When a handsome guy like him dress, he can wear anything. He would look fabulous in anything! If an average looking guy dress like this, you wouldn’t look at him twice! 7/10. i like how he didn’t over-embellish an already simple look. the proper color for a beige 3/4 coat is low-tide sand, though camel can mean he is still an analyst, on his way to managing direct, hence giving md’s proper respect, by consciously choosing this palette. I daresay, he would look better without the denim. The pants are ace! Any other pants, and he’d look normal. this is a great look – love the positioning of the collars. I would think perhaps the elbows would feel bulky/stiff with all the fabric – but he doesn’t seem uncomfortable. THANK You for the inspiration. I know. That is such a true comment. I do also think that tighter times make us more creative as we look for inspiration in places other than magazines and shop manequins. Every cloud does indeed have a silver lining! this is the function of street style blogs! “Street style blog” – I like that. 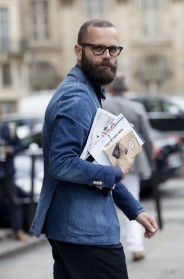 The layered denim piece might be a shirt, not a jacket. The scarf detracts. Yeah, I own all those pieces too, but they seem to be missing from my wardrobe!!!! Can I file a claim against your handsome gent???? He’s got my shoes!!!!!! I could not agree more. I've been doing the same, going through the closets, getting creative w/ what I already own. It's rather rewarding, and really I think the stylish French subscribe to this mentality anyway, regardless of the times….a good reminder that being stylish doesn't mean buying the latest, most expensive wardrobe; rather, it's about developing a discerning eye for silhouette, having a creative awareness, & taking chances. I would love to meet you and Garance in AZ. Scottsdale or Cave Creek perhaps!?!? For over a year now, I have hoped you would come and I could meet you. I wrote you at one point then discarded the message thinking that you would laugh about shooting street style here. I could show you the closest things we have here to “fashion” and style and where you may find the local fashionistas. Seriously though, it would be an honor to meet you and Garance..
You are so right! And from a environmental point of view… we have to learn how to reuse things! It won’t work buying and throwing things away all the time. I never would have thought that mixing denims could look so sophisticated! And I totally agree with the whole “shopping in your own closet” thing, I try to practice that myself! I do like this look but to my eye the “linen” peeking out from his topcoat seems a bit too studied. This will be my example of perfectly hemmed/cuffed trousers. You can see his shoes and probably the tiniest peek of socks when he walks. Perfect. I agree with your theory on the usefulness of street style blogs and the benefits of viewing and assembling our wardrobes in inventive ways. However, I don’t think this particular example is done very well. He’s wearing too many items that fall into the ‘formal’ column with just the denim in the ‘informal’ bracket. Maybe if the coat was a little less tailored or the shoes were dark brown suede. Two Words. YUM – MY!!!! He is also most marvellously handsome, it must be said. The layered denim jacket gives a good enough outfit a little something special. It seems to be a new idea or a trend in its infancy stage. It’ll be fun to watch where this goes. I’m liking the light blue denim here with the tan overcoat. Calming like sky and sand at the beach. I don’t think it looks ‘too studied’ at all although I do see what you’re getting at — some (unecessary) details can at times become frills. I think the denim matches his character perfectly, don’t you feel like you already know the man by simply looking at him? This guy doesn’t seem to me like he’s too snobbish for denim and the scarf looks like it is worn and washed. I took a look at this man from the top down and as soon as I reached the simple but classic shoes it comes together as natural and honest. Style reflects ourselves and I think the reason so many of us love this ensemble is because the personality that it showcases is one that is likely down to earth with salient sophistication. At least that’s my take. Scott: Love this look and your comments as well. I notice you haven’t been posting as many remarks with your photos lately. I miss them! Everything here looks like it really goes well together, and I never would have thought of layering over a denim jacket. I’m curious how I might do it with a raw denim jacket (the one I have :)). Also, it’s nice to see your comments under the photos to add perspective. It’s something I’ve missed of late. i agree with you, the sartorialist. looking at your blog full of interesting stylings reminds me that i have lots of great clothes. so what if i am newly poor (again) and can’t buy clothes any more. there is no limit to the combinations i can enjoy with what i have! I absolutely agree with this sentiment. Even if buying things during the recession is unfashionable it doesn’t mean we have to stop dressing well it just involves a little bit more creativity than we are used to. A friend of mine once told me “A good suit with a change of shirt, tie and pocket square as well as good accessorizing can be three different suits in three different days. All very well commenting on the qualities of his “gear” and complimenting Scott on his choice of backdrop etc…. but who is the man in the worsted cloth? Is he Italian? Or Swiss? He doesn’t look like your typical French man. I really love your photos, but I often find it hard to see the details in pictures such as this one. It would be nice to see the denim layering up close. Perhaps you could consider linking each picture to a larger version? I love his look; it works for him. Though, if his coloring and frame size were different – who knows? It might not have worked as well. For example, as an Asian, I couldn’t look as good as he does. with this same outfit. I consider also that he looks very sophisticated! Exactly. When I went to my parents’ house, I discovered a lot of old cloths of mine. I can see myself wearing a lot of layers; combining new and old cloths and look great. you can not wear 5 layers when it’s a hundred and ten degrees outside. Scott, you nailed it when you said The Sartorialist fits our needs in these economic times. That’s why I’m here: to be inspired, to get ideas for styling what I have, not buying more. So I let my W subscription run out, and the same for In-Style. Magazines never encourage personal style, only pre-fab looks. They sell. They dictate. What to buy, how to dress. Throw out your clothes each season and start over. Wastefulness. No way can one express individuality while following magazines. These pictures prove that. Ever since I set myself free from fashion editor tyranny, I have had more creative fun with my wardrobe than I’ve had in years, and thanks to this blog. I concur! And thank you for that! That is wonderful. I love it. Thanks for sharing that with us. This guy definitely nailed it. yes, jeans makes his look fresh and new. I’ll take one of these for Christmas. Thanks! Wise words Sart. I really love this man’s combo!!! i love the photos of men that you take! This Itilian fellow pulled this off quite nicely! I think his color combination is what helped everything just blend without making the texture combination an eyesore. Everything is nicely tailored like a real Italian classic gentleman, and perfectly layered so that it does not look bulky and like he over did it. No doubt about those French men. When they get it right, they get it perfectly so. It’s an inspiring dress-down for the formal coat. He looks ready for a nice brasserie lunch date, a morning at the gallery, actually he looks ready for anything … and from reading the posts above, he would have a lot of takers! I know exactly what you mean, and that is why I enjoy reading your blog so much. It is such a rich library of inspiration, and ideas on how to combine items in new ways.I think fashion is an art, in which creativity is all you really need. But, on days when creativity is slightly distant, it’s good to have your blog, and let other people’s style inspire. Thanks for daily inspiration! I posted this comment before, but I think I deleted it by mistake..
Great combination- light pale blue with camel…… so sophisticated. But just a little boring, probably sunglasses will complete the image. your post is absolutely right. first, it was a woman who changed me, and now your blog, thanks for making me see my wardrobe in a different way.